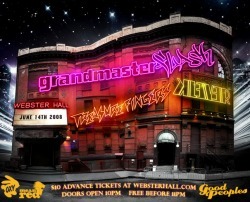 Free Clubbing at Webster Hall - Information Desk! Webster Hall has been in New York as long as the Statue of Liberty has (no joke), but unlike Lady Liberty, Webster Hall has changed with the times and remains a mainstay in New York's club scene. Most of the world's premier bands have played here at one point or another and every weekend since 1886, almost 3,000 people looking to party pay the $40+ cover to be let in. Unlike those poor bastards, hostelers get in for FREE! Drinks can be expensive, so check out our happy hour at 8pm. Be sure to arrive at Webster Hall before midnight or you'll be paying retail cover charges.